Solution: Comforting Massage Oil is an advanced blend of natural oils specifically formulated for relaxation and skin rejuvenation. Natural essential oils from Lavender, Chamomile and Patchouli are combined with Grape Seed, Apricot and Almond Oils to provide a full spectrum of emollient properties. 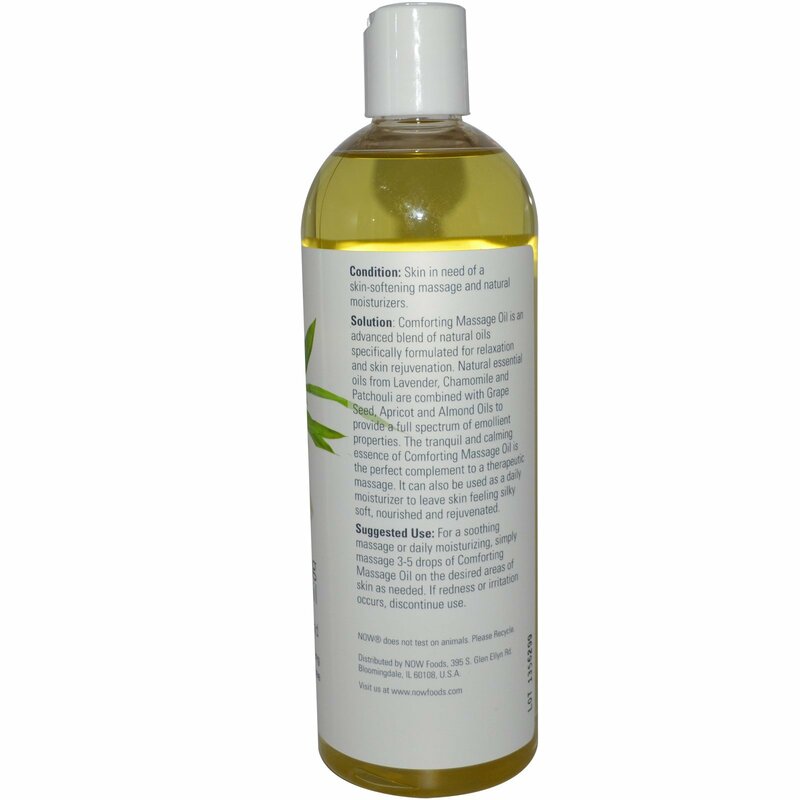 The tranquil and calming essence of Comforting Massage Oil is the perfect complement to a therapeutic massage. It can also be used as a daily moisturizer to leave skin feeling silky soft, nourish and rejuvenated. NOW Solutions is the next step in the evolution of personal care products. This comprehensive natural line encompasses anti-aging moisturizes and serums, bath and body gels, shampoos and conditioners, oral care, skin care, and essential oils, all of which are formulated with the finest functional ingredients from around the world. For a soothing massage or daily moisturizing, simply massage 3-5 drops of Comforting Massage Oil on the desired areas of skin as needed. If redness or irritation occur, discontinue use. Grapeseed oil, sweet almond oil, apricot kernel oil, aroma oil blend (lavender oil blend, pine needle oil (siberian), palmarosa oil, patchouli oil, chamomile oil, geranium oil) and vitamin E (natural d-alpha tocopherol). NOW Solutions products avoid harsh chemicals and synthetic ingredients in all of our formulations, to provide a more natural product line.